The British team is off to a strong start to the season, which the riders said is important in the sponsor search. Team Sky has come stampeding out of the gate early in 2019 with a string of top results that mean only one thing: winning is the best advertising for a new title sponsor. The team’s riders are holding up their part of the bargain as cycling’s best-funded team faces an uncertain future. With current backers set to leave at the end of 2019, the team’s roster knows that the soundest way of attracting a new sponsor is winning often and early. “We have to do well because we are looking for a new sponsor,” star rider Chris Froome said this week in Colombia. “We want to get those results to do what we can to help” in the sponsor search. The team was in for a shock in December when longtime backer Sky confirmed it was leaving at the end of 2019. Team Sky’s riders, however, aren’t taking the uncertainty sitting down. The team’s early season aggressive tilt indicates that riders realize that they can only control what happens inside the race. Team boss Dave Brailsford and team management are working behind the scenes to assure the team’s future. At the season-opening Santos Tour Down Under in January, Team Sky was already shaking things up. It put Woet Poels on the attack in several key stages and hit the TDU podium for the first time in franchise history. That aggression continued into the Herald Sun Tour, where Dylan van Baarle up-ended EF Education First and Michael Woods, who won a decisive climbing stage to take the leader’s jersey, by snatching the GC out of a breakaway. The team also won two other stages during Australia’s oldest stage race. Though things were slightly muted at last week’s Volta a la Valenciana, where defending Tour de France champion Thomas made a quiet season debut, the action will heat up again this week at Tour Colombia 2.1. Froome is making his season debut and Colombian star Egan Bernal will line up as defending champion. It’s nearing the middle of February and the clock is already ticking. 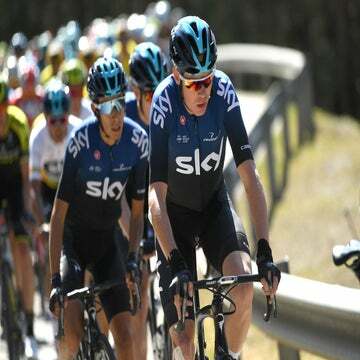 While Team Sky is funded until the end of 2019, riders will start getting nervous if a firm deal to carry the team into the future isn’t buttoned up by the start of the Tour de France. There have been unconfirmed reports that new team owner Comcast — which bought out Sky last fall and the cycling team as a result of the deal — might fund part of the team’s budget for as long as two seasons in light of the team’s unique ownership structure. Brailsford, however, still needs to find a name to put on the jersey. Speaking during a press conference Monday in Colombia, Brailsford wouldn’t give much away in terms of how a sponsor search is going. Officials have already said they would not be providing a running commentary on the team’s future until something is buttoned up. There have been rumors of possible deals with Chinese companies, French luxury conglomerate LVHM, a possible merger with Israeli tycoon Sylvan Adams, and even a quickly denied offer from Oleg Tinkov. While the negotiations play out behind the scenes, Thomas said riders are staying focused on their job of racing bikes. Team Sky has always raced hard. Now that the stakes are even higher, the team will be pressing the action even more all season.